In some high security environments, software installation is not permitted due to internal policies; for example, some large enterprises do not allow employees to install software on their computers, thus employees do not have administrative rights. 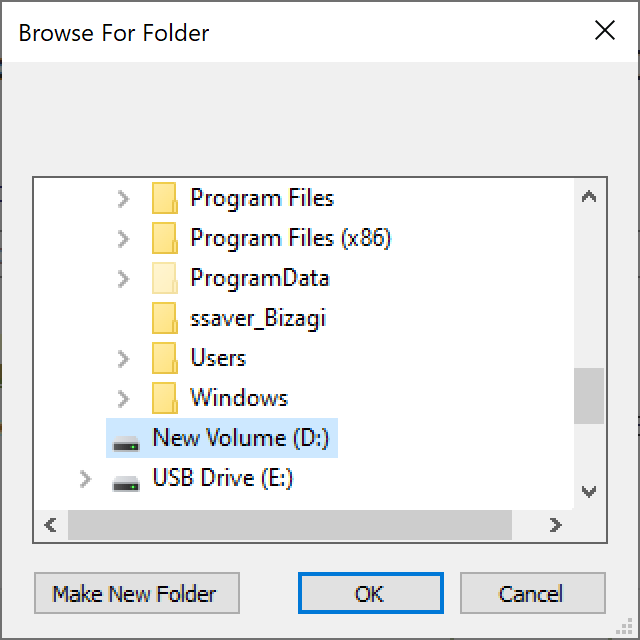 Bizagi offers a pen drive edition which lets users run Bizagi Studio from a USB drive, file server (such as Dropbox, One Drive, etc.) or any external storage device, without the need of having administrative rights. Bizagi Studio Pen Drive enables working in a collaborative project without having to install Bizagi Studio in the each Workstation. With the Pen Drive users can log to a central server repository and work on the development of an automation project. Bizagi Studio Pen Drive avoids the installation of Bizagi components such as the Standard Server Operation Service, IIS, Scheduler and a Database. •Make sure your drive has at least 2 GB available space. •Have the Bizagi Studio Pen Drive edition file at hand (click here to download it). •Bizagi Studio full edition must be installed at the central server along with all its components. •Your account must be included in the Bizagi and Administrator group in the central server. •The Server Operations Service must be running at the central server. •The version installed at the central server must match the version of the Pen Drive. •Windows 10 (all editions supported except Windows 10 SL). •Windows 7 SP1 (Ultimate, Enterprise or Professional editions supported). All these versions must have their Service Packs up to date. The following features are not available when using Bizagi Studio portable version. •Licenses: there is not an option to open the licenses on the server. •Create projects: Creating projects is not available using the Bizagi Studio portable. •Update projects: Updating projects is not available using the Bizagi Studio portable. •Delete projects: Deleting projects is not available using Bizagi Studio Pen Drive edition. •Web Server: Changing the Web server is not available using Bizagi Studio Pen Drive edition. 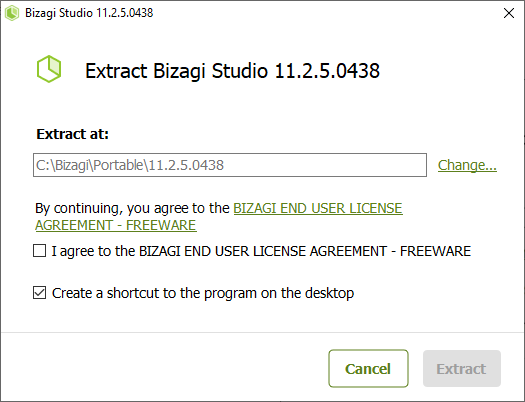 •One click deployment: Bizagi Studio portable does not allow using one click deployment. 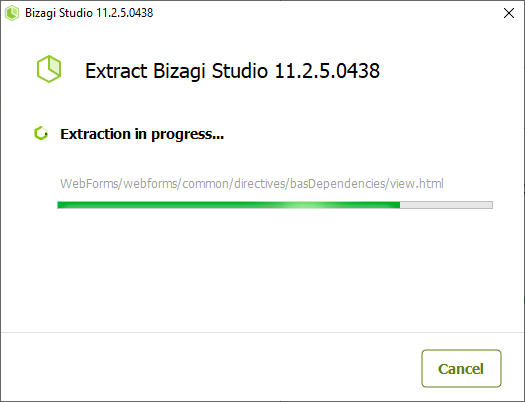 •Process Xchange: Bizagi Studio portable does not allow downloading projects from the Process Xchange. To extract Bizagi Studio Pen Drive edition, follow the steps presented above. 1. Run the executable file. 2. Select the destination path where you want to have the Pen Drive extracted. In this example, we use a USB Drive. 3. Click Extract to unzip Bizagi Studio Pen Drive edition. This may take several minutes. 4. Once the extraction process is completed, you will find the Studio Client folder in the selected path. There, you will find the following folder structure. 5. 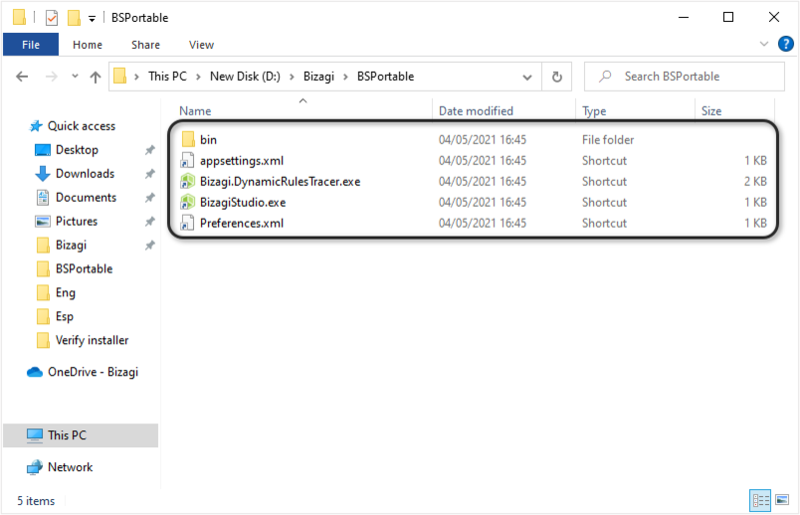 Open the Studio folder and run the BizAgiStudio.exe file to open Bizagi Studio. You can create a shortcut to make this file more accessible. To do so, simply right click it and select the option Create shortcut. Then, copy this shortcut in the desired location. Once you have extracted Bizagi Studio Pen Drive edition, you can copy the extracted folder in another location to use the Pen Drive wherever you need. You can connect to a project to start working collaboratively in Bizagi as described at Opening a project.